Maggi had been a big part of our lives for eons and then suddenly, on a fine sunny day it was taken away from all shops, from our life!! I worried, my friends did too, about how we would cope in a world without ‘Maggi‘! Would we be able to slurp and enjoy our favourite food ever again? Were we aware of what else could be ready in two minutes? Well, at least quickly if not in just two minutes?? I did get an answer and this is what this post is all about. There is a big, big world of noodles our there; from Delicate Soba, Somen, Udon, Rice, Glass to of course the ones used in Ramen – the chewy, springy variety! Some of these are from China while others are a staple of Japan, while others from countries spread across… a lot of these used in various dishes across the far-east and people across the world have just come to love them all. A good fact to know is that Soba (made from buckwheat flour) is great served chilled, especially in the summer, with a simple dipping sauce made from dashi, soy sauce and mirin and for colder days, throw soba into a soup or a broth to beat the weather blues. For those of you, who can’t find the wonderful Soba, look out for the Korean Acorn noodles. These are used as an alternative to Soba and typically made of acorn flour and buckwheat or wheat flour and find similar uses as that of Soba noodles. We all know that seaweed is a wonderful super food and if you are lucky enough to lay your hands on Kelp noodles, then you are in for a great treat! These Korean noodles made from kelp (seaweed) and can either be added to salads, soups or can even be eaten raw! Totally delicious! Then there is the wonderful Somen. These are similar to soba but made with wheat flour and oil and delicious in cold salad on sunny, warm days. Not seen in menus outside the Far East countries though! Then, comes along another favourite of mine – the gorgeous Glass noodles. Not made of glass 🙂 but become translucent when soaked in hot water! 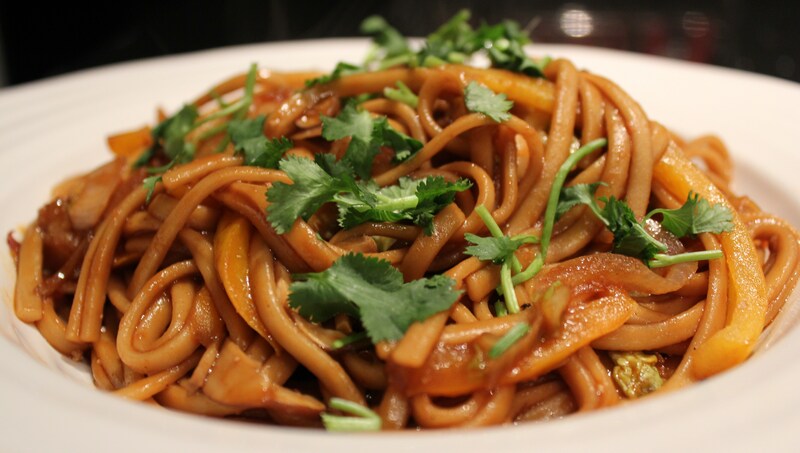 These noodles are made from mung bean, yam, or potato starches. They are delicious is salads, soups and stir-fries and you will find them often in various cuisines such as Korean, Thai, and even Vietnamese. The Mung bean ones are totally delicious and super quick to put together in a dish! Also, have you tried the Buckwheat vermicelli? These are delicious Korean noodles made mostly using buckwheat but sometimes made using the Korean sweet potato. Again, are found mostly in cold salads. I can’t really talk about the ‘noodle world’ and not mention the very versatile Rice noodles (made simply with rice flour and water). A lot of Vietnamese, Chinese, Thai and Malaysian dishes make use of this creation. We in India love to put together a quick rice vermicelli dish using this and flavour it with peanuts, onions and curry leaves…just divine! Still missing Maggi? Get your hands on any of these noodles and get cooking. You can buy some of these noodles online or at Japanese/ Korean grocery stores. Do checkout Yamatoya and Wakaba for exclusive Japanese varieties like Udon and Soba. There are quite a few Korean grocery stores like Kim’s mart in Gurgaon, A-mart Korean grocery store in Mahipalpur, New Delhi and a few more in INA Super market. Shilpa has experience in E-commerce fraud analysis, technical writing, technical training as well as selling. Effervescent and optimistic are some of the words that best describe her. She now runs her venture NJAS Designs and blogs for notjustashopper.